REASON FOR CHANGE: It lacks nitrogen fixing bacteria on the roots. NATURAL HABITAT AND PREFERRED SITE: From north Texas down through central Texas particularly in the Blackland Prairies, Cross Timbers, also the Edward’s Plateau. Often seen in small groves on hillsides or along streams. Will grow in full sun or as an understory tree. Eve’s Necklace will grow well in rocky limestone slopes and ravines. IDENTIFICATION INFORMATION: Delicate, lacey tree with spreading branches, rounded head, pink flowers in the spring and bead-like seedpods in the fall. New stem growth and young branches a distinctive green color turning dark with age. FLOWERS AND FRUIT: Flowers are 2 to 4 inch long, pink, and wisteria-like. Seed pods form a bead-like appearance in the fall and turn a dark gray to black color. They are reported to be poisonous. BARK: Very light green on young twigs turning darker with age to gray and reddish brown, broken into small thin oblong scales. FOLIAGE: Leaves are alternate, compound and delicate in appearance. Upper surface of the leaves is dark green, lower surface is paler and fuzzy. Leaves are ¾ inch to 1 ½ inch long and ½ inch wide. CULTURE: Easy to grow in a wide range of soils, moderately fast growing, needs very little fertilizer and is drought tolerant. PROBLEMS: Few if any - should be used more. PROPAGATION: Eve’s necklace can be grown from seed or cuttings. Seeds are very hard. Germination can be helped by mechanically scarring or damaging the seed coat with a knife or file. Some people soak the seed in a mild solution of sulfuric acid for 30 to 90 minutes. A solution of acetic acid or vinegar would be safer and probably work as well. Seedlings don’t transplant well from flats and are fairly sensitive to overhead watering. Seedlings should be placed in full sun as early as possible to encourage upright growth. 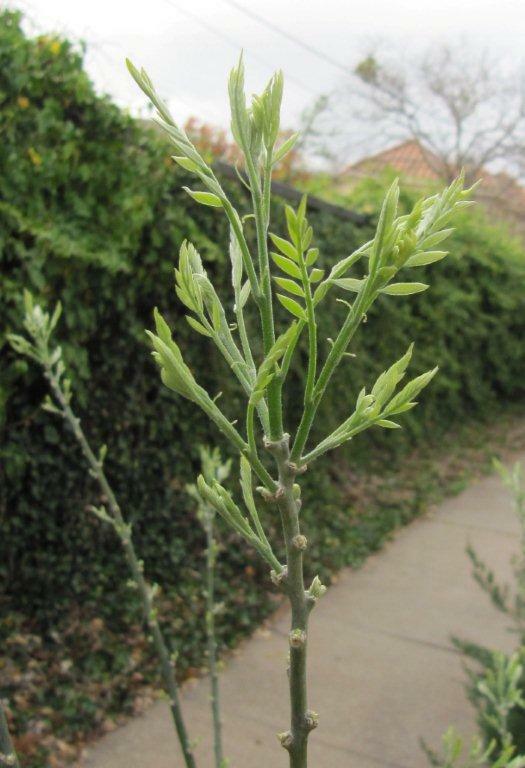 Stem cuttings should be taken in late winter before the new growth emerges. They should be kept under a mist system if at all possible. INSIGHT: The dense, hard wood is light reddish brown with yellow sapwood and is used to make a yellow dye. 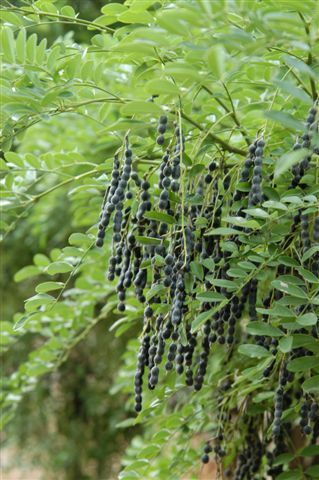 HABIT: Moderately fast-growing legume, upright, usually in the wild as an understory tree. Pink wisteria-like flowers and decorative black bead-like seed pods in fall. Bark, especially new young growth, is green. Yellow fall color. CULTURE: Easy to grow in most soils, drought tolerant. USES: Small garden tree, specimen, natural settings. NOTES: Excellent small tree for residential gardens. Native to Texas, Arkansas, Oklahoma, and Louisiana.